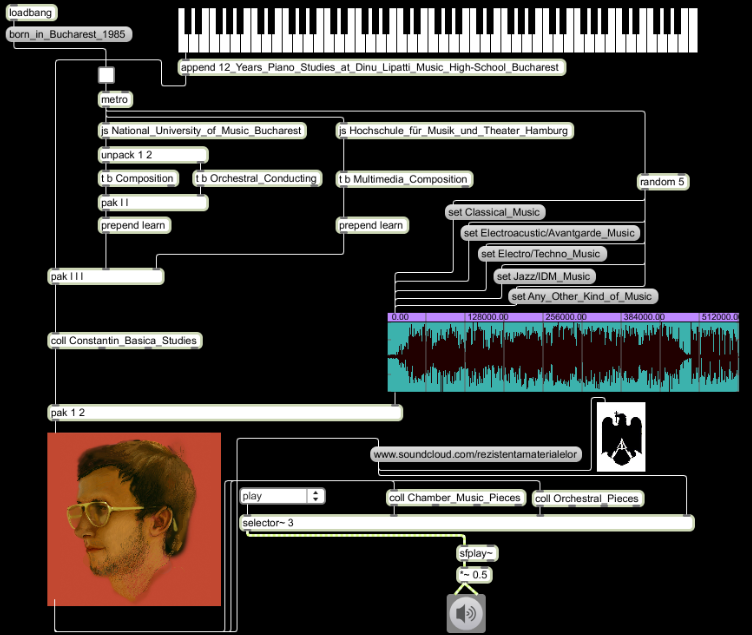 Constantin Basica is a Romanian composer living in the San Francisco Bay Area, whose current work focuses on symbiotic interrelations between music, video, and performers. His portfolio includes pieces for solo instruments, chamber ensembles, orchestra, (live) electronics, and (live) video. Many of these have been performed in Europe, North America, and Asia by artists and ensembles such as Ensemble Dal Niente, Ensemble Liminar, ELISION Ensemble, Distractfold, Mocrep, JACK Quartet, Spektral Quartet, kallisti, RAGE Thormbones, line upon line, Retro Disco, Fresh Squeezed Opera, Séverine Ballon, Tony Arnold, Karen Bentley Pollick, and Olga Berar. He received the ICMA Award for Best Submission from Europe at the 42nd ICMC in Shanghai (CN). Constantin earned a DMA in Composition at Stanford University under the guidance of Jaroslaw Kapuscinski, Brian Ferneyhough, Mark Applebaum, and Erik Ulman. His previous mentors were Georg Hajdu, Manfred Stahnke, Fredrik Schwenk, and Peter Michael Hamel during his MA and Erasmus Scholarship at the Hamburg University of Music and Theatre (DE), as well as Dan Dediu, Nicolae Coman, Doina Rotaru, and Bogdan Voda during his BA studies in Composition and Conducting at the National University of Music Bucharest (RO). As an educator, Constantin has taught and conducted workshops at Stanford University, Escuela Superior de Música in Mexico City, the 2016 Sound and Music Computing Summer School in Hamburg, and the George Enescu National College of Music in Bucharest. He is the recipient of the 2018 Carolyn Applebaum Memorial Prize and the 2015 Chair’s Award for Excellence in Teaching in the Department of Music at Stanford University. Currently, Constantin is the Concert Coordinator at Stanford’s Center for Computer Research in Music and Acoustics (CCRMA). 2011 © Constantin Basica. Theme images by Ollustrator. Powered by Blogger.